A twist on an old favourite. These Vegan Mac and Cheese bites are perfect for after school snacking or packed lunches and are incredibly quick & easy to make! These Vegan Mac and Cheese Bites have been in the works since April. Yes April! I made them and photographed them then realized there was a problem. I had envisioned these tasty little bites as the perfect after school snack or packed lunch addition but the recipe I created contained nuts. It didn’t even cross my mind at the time of creation, but as I was about to type the recipe up I suddenly realized that a lot of schools are now nut free environments. 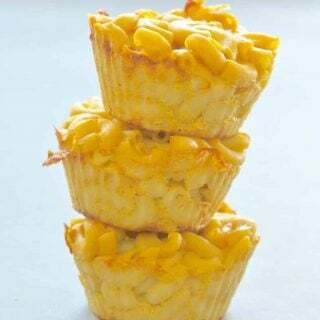 As these Vegan Mac and Cheese Bites are dairy-free, and can also be gluten-free, it made total sense for them to be nut-free too so they are totally allergen friendly. My Vegan Carbonara with Smoky Carrot Rashers and my Easy Homemade Vegan Butter were the reason I decided to use the nuts. Both of these recipes utilize ground almonds to give a creamy, buttery flavour. 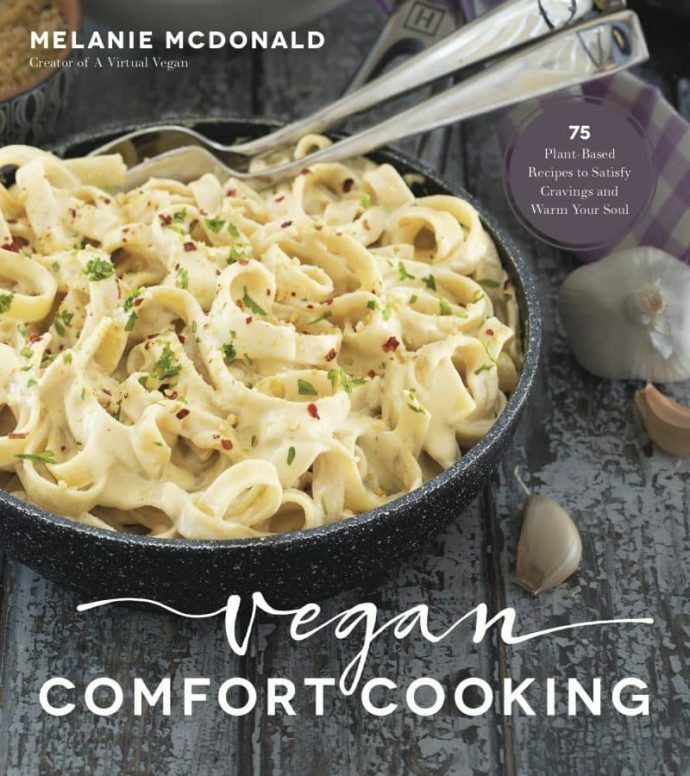 I instinctively used that idea when creating my Vegan Mac and Cheese Bites and the results were great, but when I realized my faux pas with regards to nut allergies, I had to reinvent the recipe to exclude the almonds. As I am the only one in the house who likes mac and cheese, I couldn’t trial them repeatedly until I got it right like I usually do. I had to space my attempts out and that is why they have taken so long to materialize here. Mac and Cheese is such a family favourite. It was one of my very favourite guilty pleasures before I gave up dairy. These Vegan Mac and Cheese Bites are a twist on traditional versions. They are baked in muffin tins to create adorable little handheld treats which are perfect for snacking and packed lunches. 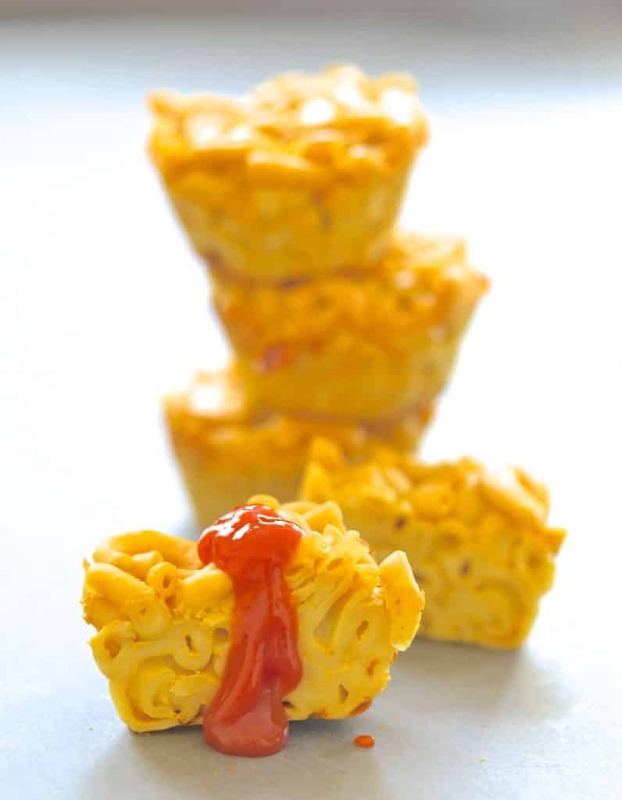 These Vegan Mac and Cheese Bites are incredibly easy to make. You don’t even have to make a sauce in the traditional way. Like my Garlic Pineapple Sauce it’s just a case of throwing everything into a blender and blending until smooth. Then you stir it through some cooked macaroni, spoon into muffin tins and bake. So simple! 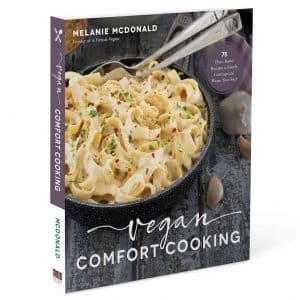 When the Vegan Mac and Cheese Bites are cooked, remove them from the oven and let them cool in the tins. My favourite way to eat them is cold with generous amounts of tomato ketchup! Of course you can eat them warm if you prefer, but don’t expect them to stay together too well. They only firm up and glue together once they cool. 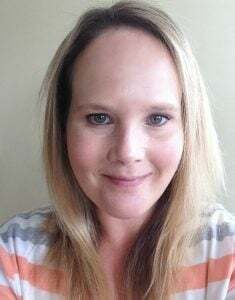 As well as being great for back to school children’s snacks and lunch boxes, they are good for grown-ups who are trying to limit fat and calories. 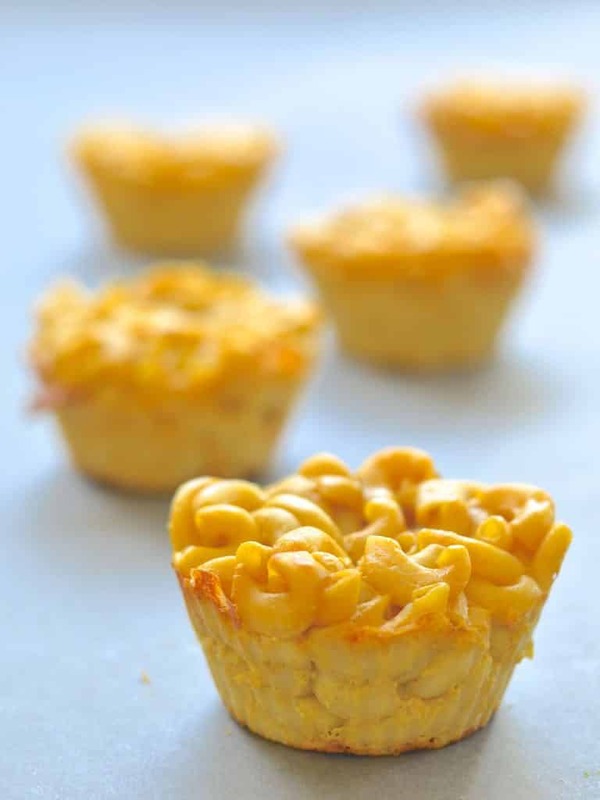 As they are cooked individually they are great for portion control and each Mac and Cheese Bite has only 78 calories and 1 gram of fat! I always use reusable silicone muffin cases to make these and my muffins. Once you invest in some they will last you years and years which saves you money in the long run and is probably a little better for the environment than using disposable paper cases over a number of years. If you do buy some, be sure not to buy the really super cheap ones you find on Amazon. They range in price from around $2 to $15. When I first got some I started with the cheapest possible and they were really thin, everything stuck to them and they were difficult to clean. When I upgraded to the slightly more expensive ones I noticed a world of difference. Nothing ever sticks to the ones I have now and I love them. I tend to leave my Vegan Mac and Cheese Bites in their cases until I eat them. Their outsides tend to be a little sticky so if you do pack them up for lunches be sure to include a little something to wipe sticky fingers with afterwards. I would love to know what you think of these Vegan Mac and Cheese Bites. Please let me know in the comments below and share your pictures of these and my other recipes with me on Instagram. Tag them with #avirtualvegan so I don’t miss them. Add the macaroni to a large pan of boiling water and cook as per the instructions (usually 8 - 10 minutes). While the macaroni is cooking sauté the onion and garlic until just starting to turn golden brown. I just use a dry pan to do this but if you prefer to use a little oil then you can. Add the onion, garlic (or cooked yellow pepper) and all of the other ingredients to a blender and blend until smooth. Drain the macaroni and return to the pan. Spoon into the muffin tin evenly, stirring a little in between so you get an even amount of sauce in each one. I am not a fan of vegan cheeses but if you are, feel free to sprinkle the top of each one with some grated cheese before they go in the oven. Store in a sealed container in the fridge. They keep well for around 5 days. These are little cups of deliciousness. I made them to go with your recipe flor barbecue beans (great combo). However, I had to point out I failed to read your instructions properly and lined the muffin pans with paper cases which stuck to the bites. I managed to scrape them away from the cases so presentation wasn’t good but the taste was lovely. Silicone cases will be used when I next make these! I like the idea that I can pop one (or maybe two or three! Into my lunchbox for work). I wonder if this would work as a larger pasta quiche using a silicone cake pan? I’ve made chickpea flour based frittatas before, do you think the sauce in this recipe would work instead? I think it probably would work. I might have to try that! I’m so pleased you enjoyed them Denise. With the baked beans sounds like the perfect combo! Hi, how long till these bites spoil if I keep them in the fridge? Thanks! They will last 5 to 6 days in the fridge. We make these every Sunday for packed lunches during the week. They make perfect snacks and the kids love them. I’m glad you are all enjoying them Heather. Thanks so much for stopping by to leave feedback! How can I keep the tops from drying out? Any piece of the pasta not completely submerged gets hard and crunchy. That’s supposed to happen. The crunchy top adds texture. If you don’t like it you could cook them for a little less time or cover them in foil when you bake them. I haven’t. Perhaps try with just one to see how it fares before you put a whole bunch of them in. I’d be interested to know how it works out! Oh my goodness, these look amaaaazing! And thank you for making them nut-free! My boyfriend is nearly vegan, but his allergy to nuts and all sorts of other things makes it harder for him than it is for me. This recipe is so perfect. I might try it this weekend so he can have them in his packed lunch for work. Unless I eat them all first! We both love violife vegan cheese so I’ll probs add some of that hehe. It must be really difficult for him with his nut allergy as so many vegan recipes include them. I am so glad he can enjoy these! They will be great with a sprinkling of vegan cheese on top! What? Really? I grew up on that stuff and still love it. Well… a healthier, veganized version of it. I have silicone muffin cups similar to yours – I love them. I find them a bit tough to clean sometimes, but overall they are pretty awesome. I can’t wait to try these – they are so gosh darned cute! Thank you! I have found that silicone muffin cups are all different. I started with some really cheap ones and they were tough to clean. I bought some slightly more expensive ones from a good store and they clean up so much easier. Thanks Hayley! I hope you enjoy them! These look so amazing! Could eat them all, we have yet to try making out own vegan food, this would defo be top of the list! Love the way your blog is laid out, so beautifully presented and informed! Thanks for sharing. You should give vegan food a try. You will be pleasantly surprised. It’s not all boring piles of salad as a lot of people think ;O) And thank you for the compliment on my blog. It was recently redesigned and I absolutely love it. It’s so much better than it used to be! You’re the only one in your family who likes mac-n-cheese? Win for you! Thanks for making it without nuts,,my family will be trying these cute bites for sure. Yes my family are obviously a bit odd! I hope your family enjoy them! These look so darn delicious, Melanie! I would love to eat a pile of them with sriracha on top. Our school has tree-nut free classrooms, so snacks have to be allergen-free, but lunch is fair game for anything as they eat in the lunchroom. 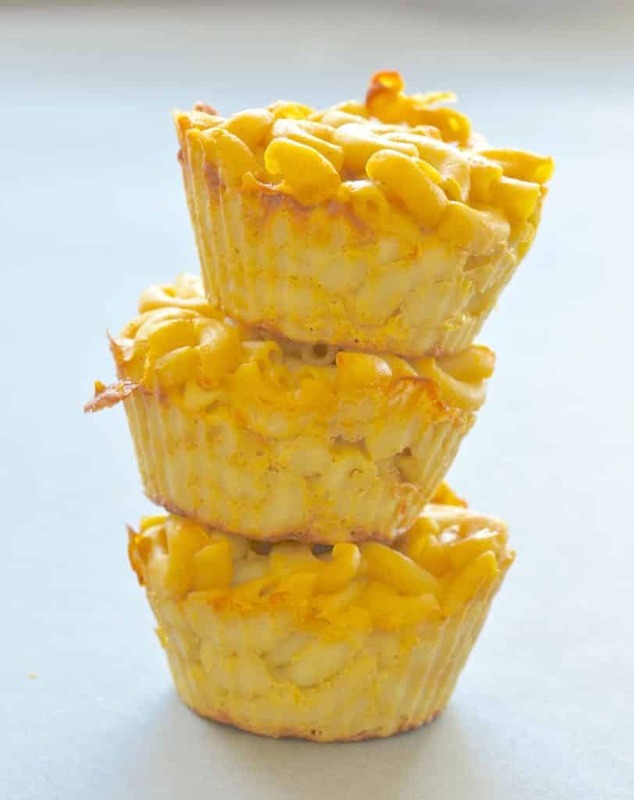 But either way, these mac and cheese bites looks awesome. My son would love to see these in his lunch box. I often send my Butternut Mac to school with him, but these are even better since they are bite-size and hand-held! Very cute! Thanks Jenn! My son is 16 so it’s been a while since I’ve had to deal with little ones lunches! OMG these look soooo amazing!! These look Delicious Mel! I did something similar but with more processed foods, so they’re not anywhere near as healthy as these! I’m going to try to get my husband to make them for me for my birthday on Monday!